Toyota said that on Monday that it will resume limited production of the Prius (pictured) and the Lexus HS250h and Lexus CT 200h hybrid vehicles. TOKYO -- Japanese automakers limped toward recovery today, with Toyota announcing plans to resume limited production of hybrid vehicles and Nissan opening its assembly plants. But the overall picture remained bleak as the country's carmakers and suppliers struggled to rebuild supply chains shattered by the devastating 9.0-magnitude earthquake on March 11. Honda and Subaru extended factory shutdowns into next week, while Honda warned that its earthquake-stricken r&d center wouldn't be in full operation for months. Thursday's small advances could generate a trickle of fresh Toyota Prius hybrids, and other popular Japanese imports such as the Mazda3 sedan or Nissan Rogue crossover. But other nameplates, notably from Honda, Subaru and the bulk of Toyota's lineup, are still stuck in limbo. Toyota said that on Monday that it will resume limited production of the Prius and the Lexus HS250h and Lexus CT 200h hybrid vehicles. But the rest of its auto assembly will remain suspended indefinitely, extending the suspensions into a second full week. "We're doing this because these models are in high demand," said Toyota spokesman Paul Nolasco. "These are being made with new parts coming from our suppliers. But we're going to take it slow to see if there are any hiccups in the supply chain." 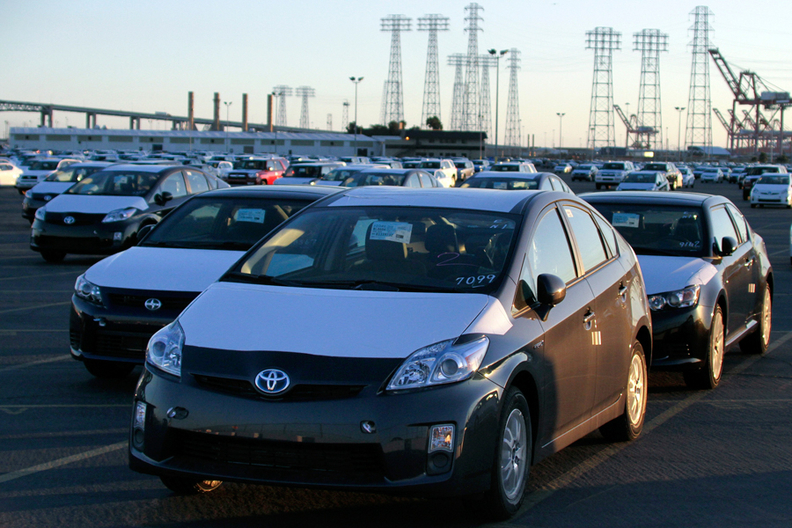 The Prius is built at Toyota's Tsutsumi plant near the company's Toyota City headquarters in central Japan, while the Lexus models are made at Toyota Motor Kyushu in southern Japan. The world's largest automaker previously had suspended work at its 18 domestic assembly plants through Sunday, saying it would lose production of 140,000 vehicles. In a sign that those numbers will grow, Toyota also warned that its North American plants may also cut production because of shortages of parts from Japan. Elsewhere in Japan, automakers were edging forward with limited production, based on parts already in stock or on whatever inventory it could source from suppliers. Nissan Motor Co. said its five domestic assembly plants resumed operation on Thursday. But those plants are working on cars already in progress and with components in stock. "There are no new parts coming," Nissan spokesman Mitsuru Yonekawa said, adding that production will halt when the bins run dry. "We are not sure how long they will last." Mazda Motor Corp. and Mitsubishi Motor Corp. also continued some assembly Thursday.Mazda was continuing assembly of vehicles already in process at its two plants, using existing parts inventory. It will continue production at both plants on Friday. But after that, it expects components at its Hofu plant to run out, leaving only the Hiroshima plant to continue operations on Monday. That plant will keep working until its supplies are exhausted, Mazda said. Mitsubishi was running only its Pajero truck plant; its car factories were still down. On Friday, however, Mitsubishi planned to reopen its Okazaki assembly plant. That factory makes that Mitsubishi Colt and the Outlander Sport small crossover. Only the Pajero plant will operate Saturday, Mitsubishi says. Plans for Monday are undecided. The list of companies still on hold is substantial. Suzuki Motor Corp. shut its factories Thursday after half-day production earlier the week. It will keep them closed Friday and assess future plans after that. Subaru parent Fuji Heavy Industries, Ltd., said it was extending its shutdown through Monday as well. It cited concerns about constrained suppliers and an unstable electric grid. Honda, whose assembly plants have been down since March 14, said it will keep them closed through at least April 3. It previously had suspended production through March 27. Honda also warned that repair work at the damaged automobile unit of Honda R&D Co. in Tochigi prefecture, an area hit by the March 11 quake, will take months. It the interim, Honda is transferring some of the tech center's work to other locations. During the quake, one person died and 30 were injured at the Tochigi r&d center.